Dedication of Our Lady of Rheims, built by Saint Nicasius, archbishop of that city period in the year 405. (It is currently believed the church may have been completed in the year 400 or 401.) It was Saint Nicasius who prophesized that France would be invaded by the Vandals, telling the people of Rheims to prepare themselves. When the Vandals finally arrived at the city gates, Saint Nicasius went out to meet them with his sister, a faithful lector and a deacon. All were killed, but their sacrifice gave time for more of the people of Rheims to flee to safety. This was the church where King Clovis humbly confessed his belief in the Triune God and was baptized by Saint Regigius in 496, and where all of the subsequent French kings were crowned. In the Gallery of the Kings there is a magnificent painting of the baptism of King Clovis surrounded by images of all of his successors. This church, having fallen to ruins, was later rebuilt by Ebo and Hincmar. It was finished in the year 845 and still remains a place of pilgrimage to the Mother of God. At one time enemies of the cathedral chapter set fire to a monastery of Rheims. Among the relics which the sacristan tried to save was an ivory statue of the Virgin, containing some of her hair. The sacristan prayed fervently to the Virgin that she would preserve this relic. The abbot, entering the ruins of the church, found the statue upright and unharmed as if placed there reverently. From thence forward, the image was believed to be miraculous. The present cathedral takes the place of the older churches, the previous one having been damaged by fire in 1210. 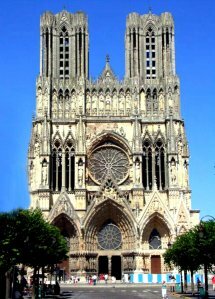 It was not completed until the 14th century, and is the beautiful Gothic Cathedral that can still be seen today.